While many countries try to stem the flow of anything foreign (whether people or ideas) across their borders, musical boundaries have become so porous that it now feels natural to see a pipa alongside Western strings. 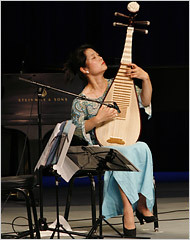 Wu Man performing at the Concert for Peace Tuesday. That musical combination was featured in the Concert for Peace, presented by Musicians for Harmony on Tuesday at Symphony Space in the group’s sixth annual commemoration of Sept. 11. Musicians for Harmony was founded after the Sept. 11 attacks to promote dialogue between warring cultures, and its principal founder, Allegra Klein, has been working with musicians in Iraq. The concert featured Western chamber works and music of West Africa. The mesmerizing pipa player Wu Man presented a traditional Chinese piece, “White Snow in a Sunny Spring, ” and the premiere of “Soliloquio Serrano” by Gabriela Lena Frank, a California-born composer of Peruvian, Jewish and Chinese heritage. Ms. Frank, who has written for the pipa before and has a remarkable facility with the instrument, provided Ms. Wu with a virtuosic, expressive tapestry inspired by the harawi, a melancholy song genre from the Peruvian Andes. Ms. Wu was joined by Colin Jacobsen, a violinist, and his brother, Eric Jacobsen, a cellist, in a stellar rendition of Chen Yi’s “Ning.” This striking, texturally colorful work, veering from frenzied agitation to meditative resignation, commemorates the Japanese 1937-38 massacre in Nanjing. Colin Jacobsen also played with Musique Sans Frontières, the dynamic multicultural house band of Musicians for Harmony. Here the ensemble explored the hypnotic rhythms of West Africa, with lively contributions from two Malian artists: Yacouba Sissoko, playing the kora (a West African harp-lute), and Baye Kouyate, on talking drums. The lineup included “Bambougoudji,” a West African song; the premiere of Mr. Sissoko’s “Siya”; and the premiere of “Couleurs du Marché” (“Colors of the Market”), written by Patrick Derivaz, the artistic director of Musique Sans Frontières, who played electric bass. The ensemble also included Rubin Kodheli on electric cello and the percussionist Benny Koonyevsky. The concert opened with a somewhat matter-of-fact performance of Mozart’s Piano Quartet in G minor by the pianist Claude Frank and members of the Guarneri Quartet: the violinist Arnold Steinhardt, the violist Michael Tree and the cellist Peter Wiley. In contrast, the Shanghai Quartet gave a stellar account of Ravel’s String Quartet in F, and its passionate playing — driven, elegant and nuanced — inspired energetic clapping by the audience between movements.